Animal Defenders International (ADI) is calling on HBO to stop using wild animals after two live elephants featured in the latest episode of ‘Westworld’. An ADI investigation of supplier Have Trunk Will Travel reveals the brutal behind-the-scenes training techniques used to make the elephants perform. Shocking undercover scenes show the animals being beaten and electric shocked with stun guns. One of the elephants appearing in the sci-fi drama, a 51 year old female called Tai, is shown in the footage crying out as she is shocked with a stun gun to do the very tricks seen on screen, including movies such as Water for Elephants and Zookeeper. HBO has stated that, “We are reviewing the circumstances related to archival training footage, which included one of the elephants that appeared in the series.” Despite assurances that “none of this video was shot during the production and does not in any way reflect practices on our sets,” no such guarantees can be given for the welfare of animals off-set and while they are being trained. 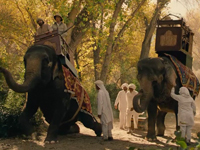 During the release of Water for Elephants, the producers, stars, and trainers stressed that Tai was trained with kindness, marshmallows, and positive reinforcement; as the ADI footage shows this could not be further from the truth.